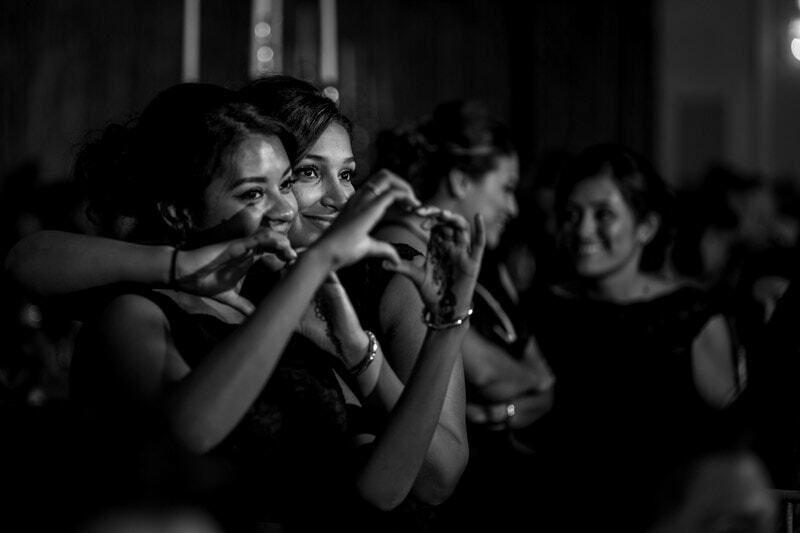 Your wedding day is all about you. But without your guests, there would be no celebration. Make sure your guests know just how grateful you are to have them be a part of your day. Appreciation doesn’t come from big expensive gifts; it is in the little details that show your guests you were thinking of them. 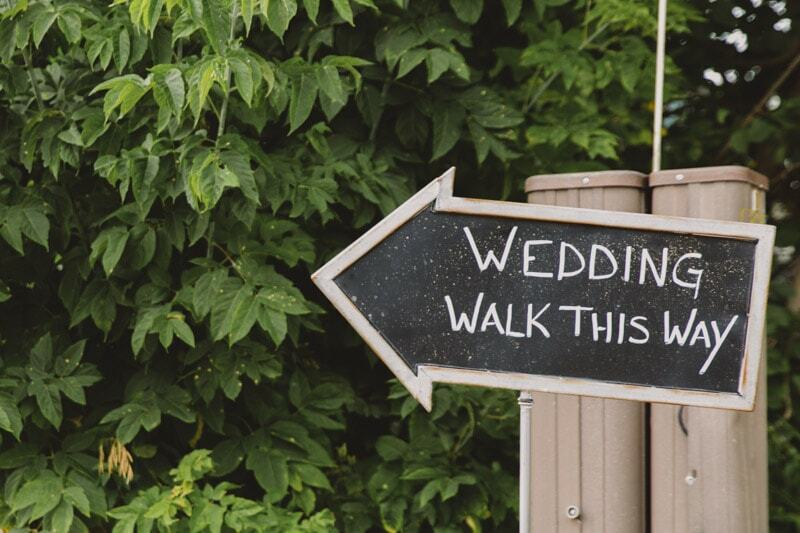 Wedding websites – The internet is at our fingertips. This makes a website the easiest way to share information about your wedding, answer your guests’ questions, and collect RSVPs. Creating a website is as simple as finding a readymade template online and uploading your own pictures, colour scheme and information. Accommodation – Your guests will be joining you from near and far. Make their travels as easy as possible by researching hotels for them. Negotiate a discounted group rate with the hotel and reserve a block of rooms. Then, make sure your guests have the hotel info as soon as possible so they can book! Welcome baskets – A simple and meaningful gesture for your guests is to give them a little welcome gift. It can be as simple as including some goodies and a note of thanks. Take it one step further and include a map with local restaurant recommendations and information on tourist spots so guests can make the most of their visit. Whether from Montreal, Toronto or Vancouver, make sure you show your guests some love! Reception seating plan – A seating plan is a great way to encourage your guests to socialize. 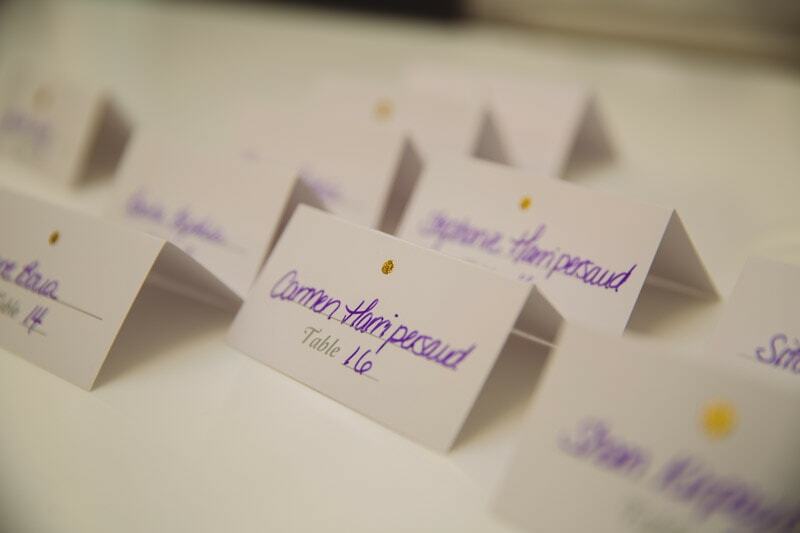 You can save some time and energy by assigning guests to a table rather than specific seats. Take this opportunity to test your matchmaking skills! Make sure you are well organized, and consider having an usher to help your guests along. Cocktail hour – Your wedding will be a very busy time between the ceremony, photo shoots and getting the party started. A Cocktail Hour is time you designate specifically to your guests. With all your friends and family reunited in one spot, this is the perfect time to mingle, take pictures and catch up. Guest books – Guest books are a great way to engage with your guests. In place of traditional guest books, consider other creative ideas. You can set up a photo book with polaroids, or a camera for a video book. Or, a much simpler idea, you can give your guest book a theme such as “Advice for Newlyweds” or “Ideas for Date Night”. Entertainment – In addition to a great DJ, think about other ways in which you can keep your guests engaged and entertained. Collect song requests on your website, keep speeches and slideshows short, and leave conversation topics on the tables. Consider hiring a professional emcee to keep energy high throughout the night. And think about other activities such as photobooths or videobooths! 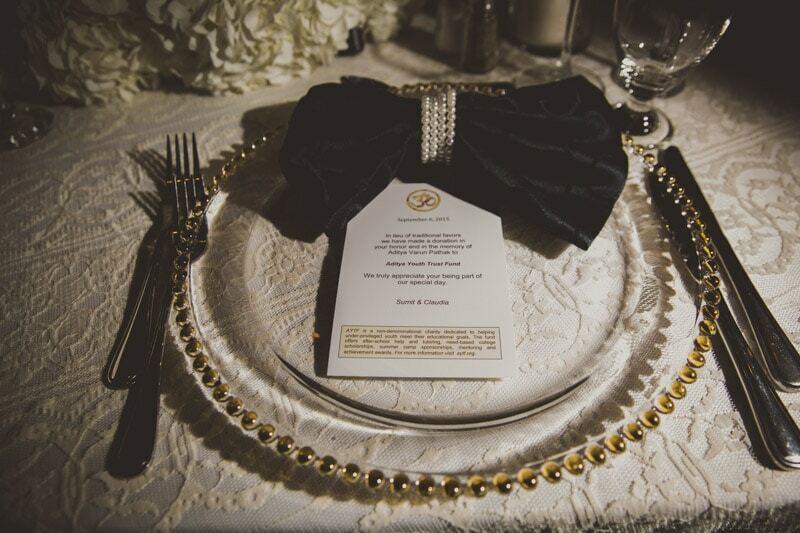 Handwritten place settings add a personal touch for the guests at your wedding. 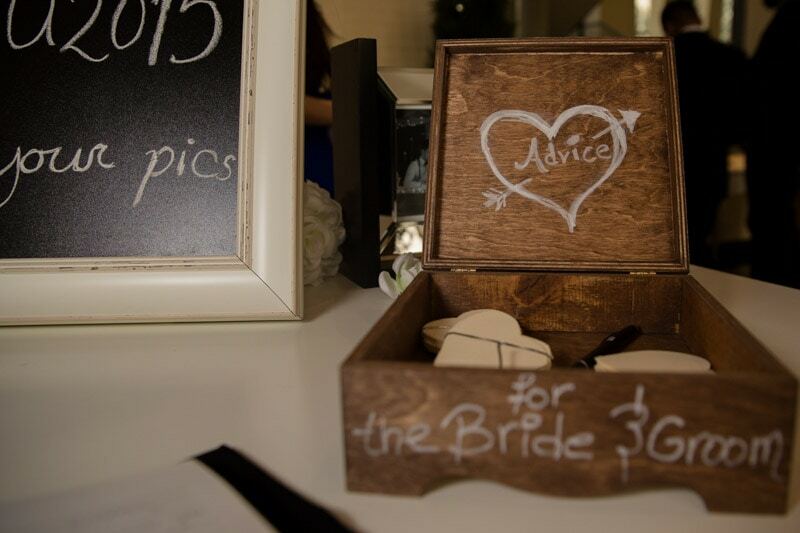 A fun activity for guests at your wedding – an advice box for the newlyweds! Wedding Favours – Favours don’t have to be expensive or extravagant. There are many simple, cost-effective and meaningful ways to show your appreciation to your guests. Options include candles, tea bags, a self-serve candy table, plant seeds, or customized M&Ms. Or, honour your guests with a donation to a good cause in their name. Thank you cards – Signing a thank you card with take only a moment of your time, but it will go a long way in showing appreciation to your guests. Take it one step further by including pictures of your guests from the wedding along with your cards. Be sure to not wait too long in getting these cards in the mail! Refreshment kits – A simple way to create a luxurious feel and to help out that guest who forgot to pack some extra gum! Keep a small basket in the restroom with some essentials including bobby pins, hair gel, and body spray – you don’t have to have a lot, but your guests will appreciate the extra effort! Babysitters – Reception hall foyers can typically be seen littered with parents trying to manage their young children. If possible, consider booking a second, smaller room where you can set up movies, crayons, books and toys to keep the children entertained. Hire a couple of babysitters, and now your guests can come celebrate with you! 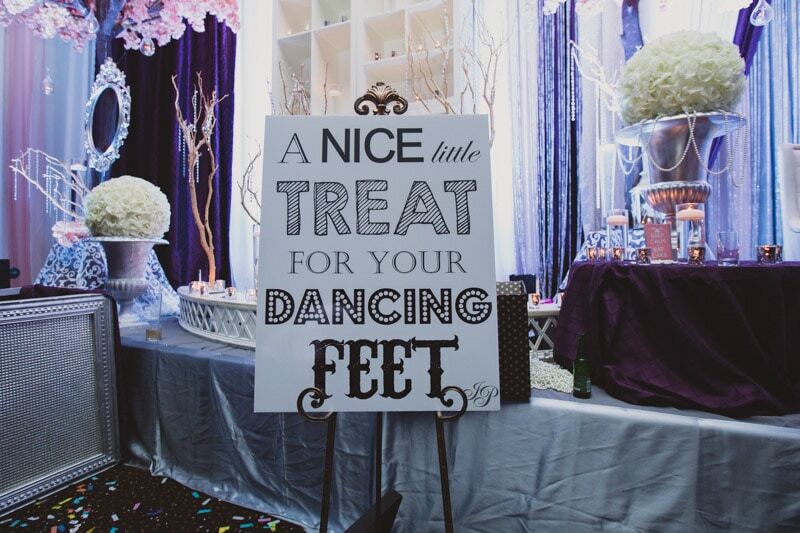 A cure for sore feet – “My feet hurt” will not be an excuse for your guests not to dance! Keep a basketful of flip flops on hand to ease those sore feet so the dancing and party doesn’t stop. Midnight snack – Satisfy those late night cravings! Order in some pizza or have some snacks on hand for those late night munchies. What are some unique ideas you’ve had to make your wedding extra special? Share in the comments below! Comfy flip flops to ease sore dancing feet.